Here's look at the expensive, complex and system for how Hamilton tackles winter storms. There are thousands of kilometres of roads, sidewalks and bike trails to be cleared and hundreds city and private vehicles devoted to doing it as fast as possible. Here's a look at how City of Hamilton battles winter storms and deploys its army of snow and ice clearing equipment. Why are some roads cleared before others? Will GPS tracking be available? And just how much salt is used in an average winter? All those questions and more are answered below. It should come as no shock that some roads are more important to clear immediately than others, but how does the city prioritise which roads receive service first? Well, there's a number of factors that go into the response time and amount of attention the snow plows will give to certain roads. Those factors include the amount of snow, the required treatments and the amount of maintenance required on a road to be considered "completed." For example, plows do not need to tend to residential roads until eight hours after 8 cm of snow has accumulated on the road. After those roads have accumulated eight cm, plows are given 24 hours before they must complete the job on residential roads. Those roads fall fifth on the city's priority list when it comes to snow maintenance. Below is the full prioritised list, including how crews treat certain roads. after plow Anti-icing? De-icing? Satl? Pickle? The priority order is not set in stone, however, and is adjusted depending on the storm. For instance, if snow or wind speeds increase, or there's prolonged freezing rain, residential roads move up the list and take the same priority as collectors. As of Nov. 2, 2015, route tracking will not be available to the public for the upcoming 2016 storm season. It is still listed as an "initiative" of the city moving forward. Route tracking has been available in other jurisdictions for years now. 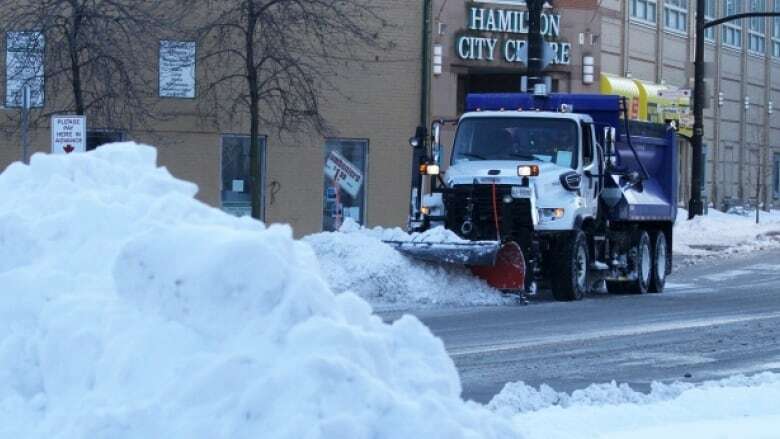 Despite pressure from the public and city councillors a couple years ago, the topic still remains up in the air for Hamilton's snow maintenance. The city maintains 6421 lane km during any given storm, which is the equivalent of a one-way drive from Hamilton to Anchorage, Alaska. To help maintain all those kilometres for an entire winter, the city on-average has to use just under 70,000 tons of salt, over 15,000 tons of pickle mix (combination of salt and sand), and 250,000 litres of salt brine. 30 contractors and 197 pieces of equipment are on-call for clearing snow from sidewalks, bus stops, the fronts of schools, cul-de-sacs etc.